I very nearly cancelled today. Less than two hours sleep thanks to the high winds, and then the thought of standing at a bus stop in Pakefield getting blown around just to take pictures of buses? However, as I was still annoyed at double-booking myself yesterday I made my way up to Pakefield and subsequently had a wonderful few hours. Yesterday saw BorderBus launch the new route and timetable for the 146, which now takes in Kessingland (why don't they just give each resident their own bus), Pakefield and Carlton Colville. Due to the timings Carlton Colville was an impossibility on a day like this, but 15 mins after I arrived Malcolm turned up on 107, the latest addition to the fleet, looking great in not only new paint but new vinyls. 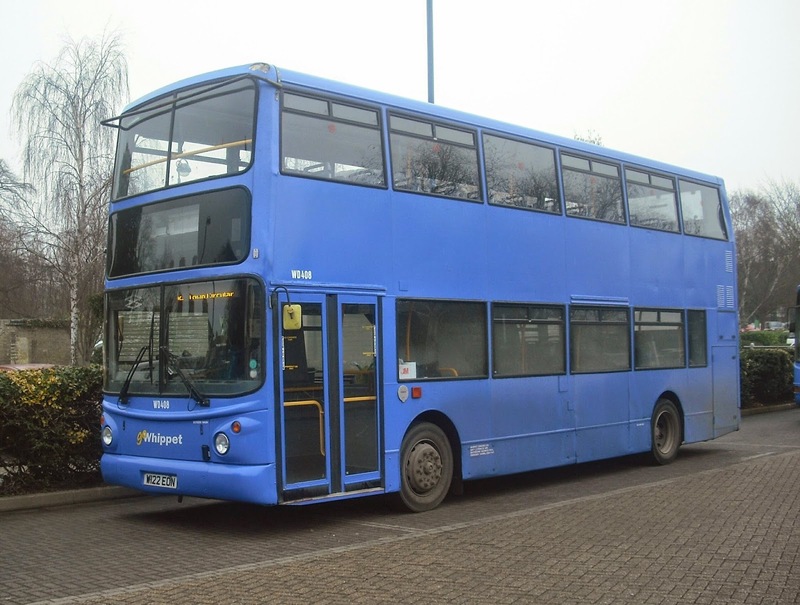 However, this bus will feature prominently in the second half of the post, as I made arrangements with Malcolm to meet him on his return from Norwich and organised a photoshoot with him along the route. 10 mins later and due to BB62 being away for a new front the E300 was on the route, and I have never been on it before. Well I've been on it now and to be perfectly honest I can't wait to go on it again. In my opinion the best bus in the fleet and I would happily go anywhere on it. I liked it so much I stayed on it longer than intended and went to Wangford, where I waited for the next one going back the other way. That turned out to be 102, BB59 BUS. A little noisier this one, with an alarmingy loud whine coming from somewhere when cruising around the 40mph mark. However today is not for vehicle analysis but publicity for the new route and at this point I need to thank all the drivers on the route today, who without exception cheerfully agreed to my requests to stop for photos. I was anxious to get as many pics on the new section of route as possible, and thanks to the BorderBus drivers I succeeded in photographing all 4 vehicles out on the route today on that new section. A couple of destination screens failed to show up on camera and the sun was doing it's best to chip in but here is BB59 in Kessingland. Next up was 103, BB09 BUS, which I think is just about the quietest of the E200's. I only went to Kessingland on her, but once again the driver made sure I got the pictures I wanted. After suffering a truly hideous journey on a First Lowestoft Dart (42358) back to Pakefield, and a lunch that never turned up it was time to meet Malcolm again. I had thought this would make a good picture, even for publicity purposes, and Malcolm, true to his word positioned the bus perfectly for this picture. I have to say I'm quite proud of it. If you go full screen the new route vinyls are beautifully clear. I stayed with Malcolm to Southwold, where another surprise was waiting for us. BorderBus had sent out their Bus Stop Inspection Team to check that stops were displaying the new timetables. I have to say that all the ones I checked were correct so well done SCC on that one. The Inspection Team comprised of Nicky and Jamie Pursey, and for half hour by Southwold Pier the 4 of us had a really good chat, including Nicky telling me off for allowing others to upset me too much! Point taken, Nicky. Good to meet Jamie for the first time, who claims to be my number one fan, and also reacted far more diplomatically than his Dad when I gave him my business card with an Anglian gas bus on it!. Not sure if I'm deserving of fans, mate, but thank you. I have a feeling you are going to be a force to be reckoned with in the industry in a few years time. A really good stress free if windswept day. I hope BorderBus have some real success on the route this Summer, because they show invention and initiative, and don't just carbon copy other operator's routes, abandoning passengers in one area just to make life a bit nore awkward for a competitor in an already over milked area. Just in case you didn't know the new route! Sounds like a movie - The Last Olympian - but in this case it's more serious. The last Volvo olympian ever built is in danger. I'm eternally grateful to Roy Northcott of East Norfolk Bus Blog for letting me copy his post on the same subject. Not feeling my best and promised to get ths post out today so thanks, Roy! I spent a very pleasant hour with Ipswich Buses Managing Director Malcolm Robson this afternoon, who gave me full details of the changes being made to the East Ipswich area in May. Last week I published what I had seen VOSA and made some educated guesses as to what was happening. I was close but no cigar! To summarise the number of buses is remaining the same, but some routes and frequencies are changing. Here is what's going to happen. X1/X3: Increase each journey to every 15 mins giving a joint 7.5 min frequency along Nacton Rd. Punctuality issues mean these services need more time which allows the frequency increase. Service 4: Will no longer serve Rail Station apart from a couple of peak trips. Service X5: 15 min frequency along Foxhall Rd, currently every 10 mins jointly with 5. Increase Sunday and evening frequency to every 30 mins from hourly. Service 6: Increase from every 30 mins to every 20 mins and link to Service 11 at Hospital. New evening and Sunday timetable every hour. New link to 11 will provide North East Ipswich with a link to John Lewis, Waitrose and Sainsbury at Warren Heath. Service 11: Link to Service 6 at Hospital gives link to John Lewis, Sainsbury, Waitrose and Ransomes Europark from NE Ipswich. No change to route or frequency. And there we have it. The reason the 5 has gone and the X5 remains is purely so passengers don't board a 5 assuming it will become an 11 at the Hospital, as it has done for many years now. I have also been told 3 new vehicles are being bought for the X5 but have been asked not to say what for a couple of weeks. Watch this space. I am also looking forward to the open topper doing circuits on the 6/11 as it will be much longer than the 5/11. My thanks go to Malcolm Robson for the drink, and also for providing the above information in written form as I have the memory of a goldfish with amnesia right now! The great thing about posting last on this topic is I have seen what everyone else has posted, and I can avoid copying and rolling out the same old images, and make it a bit more personal. Except one or two as you'll see later. 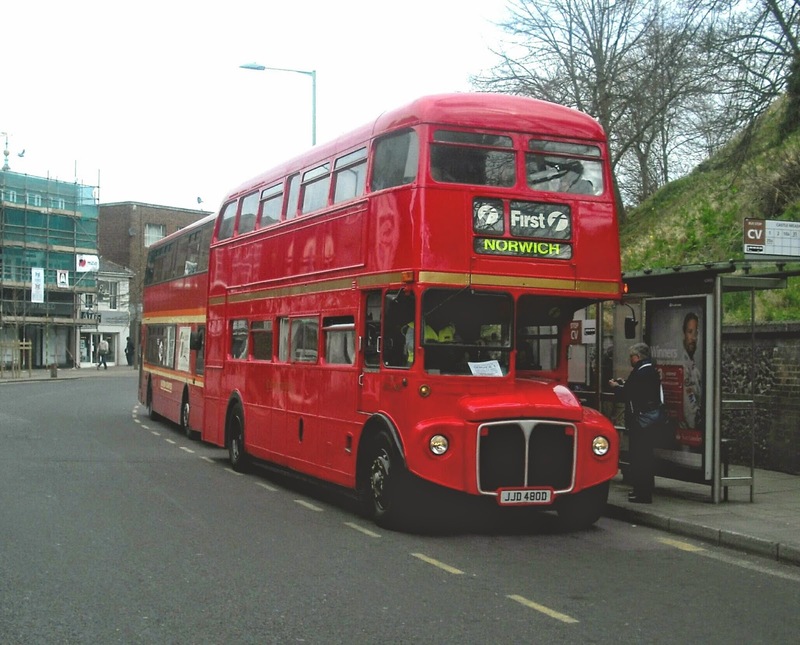 Last weekend saw the Norwich Bus Running Day, and what a roaring success it was. A lot of the success was due to the extensive publicity the event received, not least in all the various blogs. It certainly took everyone by surprise and buses were having to be scrambled to pick up the hoards of people attending the event waiting at Norwich Station and Castle Mall. What was really pleasing to see was so many families, and mums with kids. It wasn't just an anorak fest, although there were plenty of them too! Thousands of cameras and those vehicles taking part must be some of the most photographed buses in the country right now. I attended the event with my pal and all round good egg Tim Miller, and after a few hellos to some friends we caught Ipswich's own Eastern Counties liveried Volvo B7tl VA479 AU53 HJV. Alighting at Castle Meadow to allow others to get on we retired to a local eatery for lunch and natter. There is something about this particular vehicle that seems to have escaped everyone else's attention, VA479 was RETURNING TO NORWICH!!! She used to be a Norwich bus and how that hasn't been mentioned anywhere except the X1 blog is a mystery. Especially as later on at County Hall she got all nostalgic and had all kinds of Norwich destinations showing. VA479 reminiscing of past times, although how often she was ever on the 23 I don't know. RML 2480 in Castle Mall with that man Speed driving again! Not wanting to just lean against stationary buses all day I joined the merry throng heading down to First's Rowntree Way depot, which was opening its doors to the public for the first time in 20 years, and a great effort had been made by the team there too. The sign greeting the staff every day. I'm going to publish a picture seen in a few places since Sunday. Here is Trident President 33159 up on stilts in Rowntree Way depot. The observant among you will have noticed the lack of an engine. 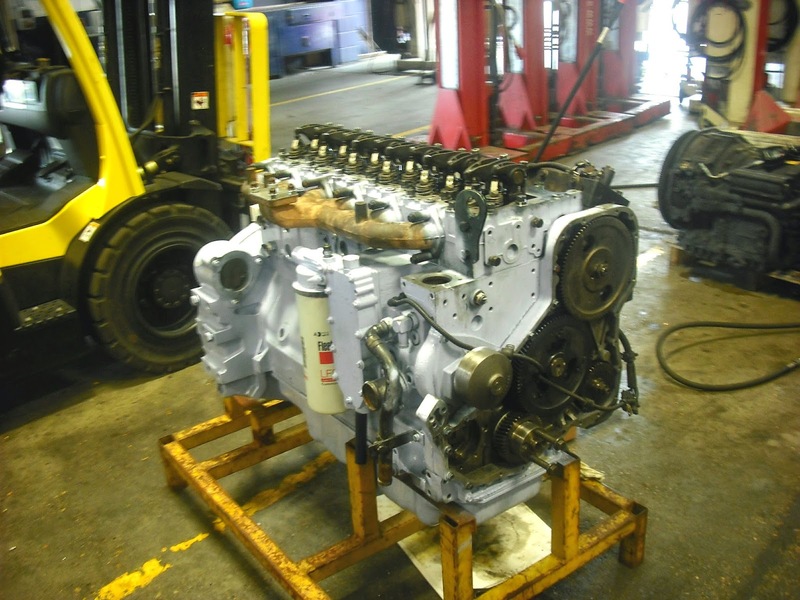 Some might say that improves the bus considerably, however a bus can't operate without an engine and here is another pic I haven't seen anywhere else - the engine!! Back at County Hall the sun had come out, which made photography a little difficult unless you got a good angle. What was generally accepted to be the star of the show made sure everyone had a good angle, and I have no shame in joining everyone else in publishing this pic of Viv Carter's eye catching open top Bristol JNG 50N which he has lovingly refurbished and brought back to glory. She looks superb. Viv Carter's Bristol VR JNG 50N stealing the show last week. Mention should go to Chris Speed who helped organise the event and nagged the blogs into publicising it. He also arranged the Rowntree Way tour and was driving either VA479 or RML 2480 most of the day, as well as finding time to talk to the many people wanting to ask him questions or just have a natter. It was also great to see so many friends there, Tim, Bryan Dickson, Dave Warren, Sam Larke, Colin White, Cameron Robinson, Jamie Glasspoole, Clive Nixon, Joe Thorpe (who also drove miles on the day), Fred from Anglian, and meeting for the first time the legend who is Grahame Bessey, who somehow managed to not only make the event but hold decent conversations despite having broadcast a 24hr marathon for charity on Harbour Radio, finshing at 8am that morning. A pleasure to meet you Grahame and glad we agree on so many topics! What was even better was people coming up to me complimenting the blog. John D in particular deserves a mention as he has supported and encouraged me from the start, and it was great to meet you in person at last, John. If I'm perfectly honest I didn't go last week for the buses - Lord knows I'm on the blessed things all week, but to meet as many friends and new people as I could. There are times I wonder just how much point there is in doing this blog, or how much it's actually appreciated, and days like last week give me an injection of faith and renewed enthusiasm, as I hope you've noticed from the increased post output in the last week. Welcome to Summer Time everyone, and another round up of what's been going on. A lot of posts this week, with some really great contributions from various people, for which I'm eternally grateful. Let's get on with it. The main news of the week has to be the changes coming to Anglian's network in May. 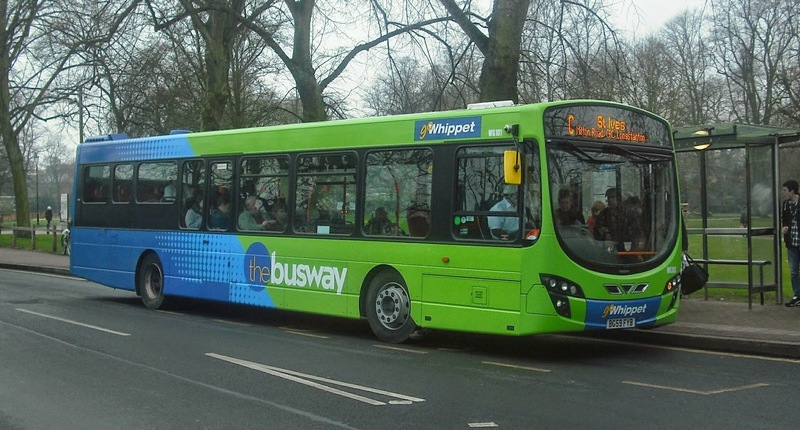 Double the number of buses to Southwold, a new 61A Kessingland - Lowestoft service mirroring First's 99, a shake up for the 60, with services extending to Bungay, Halesworth and Southwold, faster services between Bungay and Beccles on the 80. The 62 between Halesworth and Kessingland cut completely, as is the 63 between JPH and Hemsby, and the 86 between Beccles and Haddiscoe. Full details and strong opinion by clicking on link at bottom of this post. 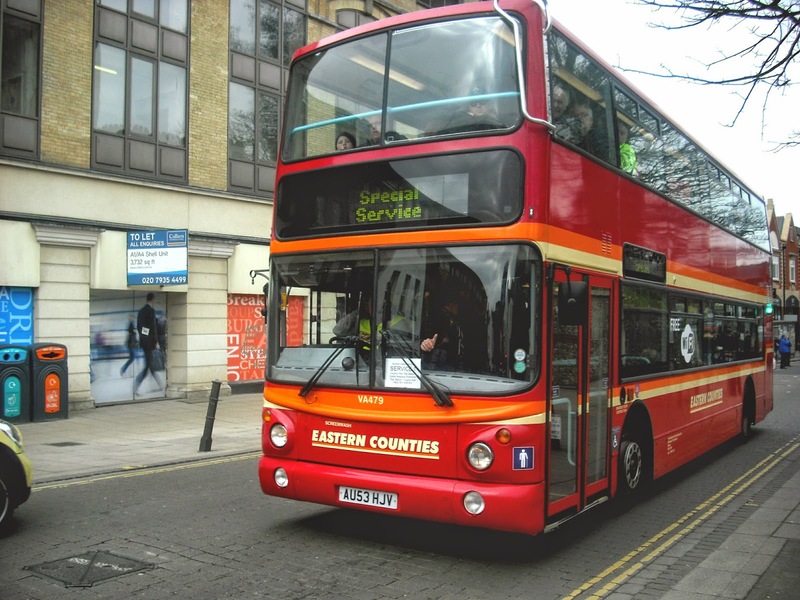 More changes are also coming to Ipswich Buses, with a shake up to services in East Ipswich. Details of the VOSA registrations can be viewed on the link at the bottom of the post and check back tomorrow for more details after my meeting with Malcolm Robson to discuss the changes. Just to share with you a remarkable day for First Ipswich. We have achieved the lowest score ever since the GreenRoad system is in place. We have achieved 15 score today and we are the best depot within EC and on top ten all over UK. 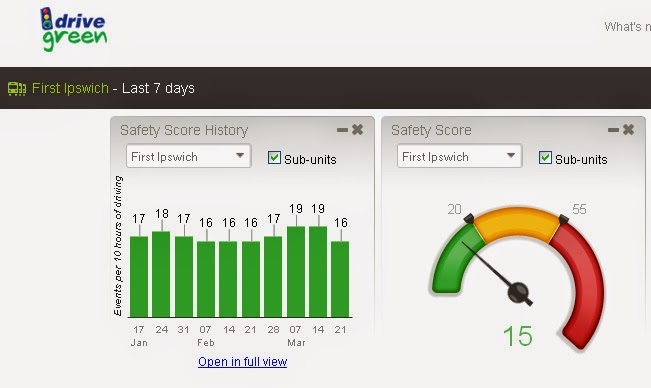 I know that you appreciate safety and comfort whilst traveling on a bus and GreenRoad system scores and monitors exactly that. Paulo included the following picture which means absolutely nothing to me (I don't understand it) but means the world to him and shows how well the Ipswich drivers are scoring. The chart showing the Greenroad scoring. Not only that but the very next day the Ipswich team scored a 14. Well done to all of the Ipswich drivers and thanks to Paulo for rightly wanting the world to know about it! BorderBus start their new timetable and route tomorrow - I'll have a report and pictures from the new section of route on Tuesday - and on Monday they revealed exclusively to this blog their most recent acquisition fresh back from the paintshop, including pics of the repaint process. The link to the post is at the bottom of this post. Across the road at Ellough Anglian also revealed a new vehicle for them. 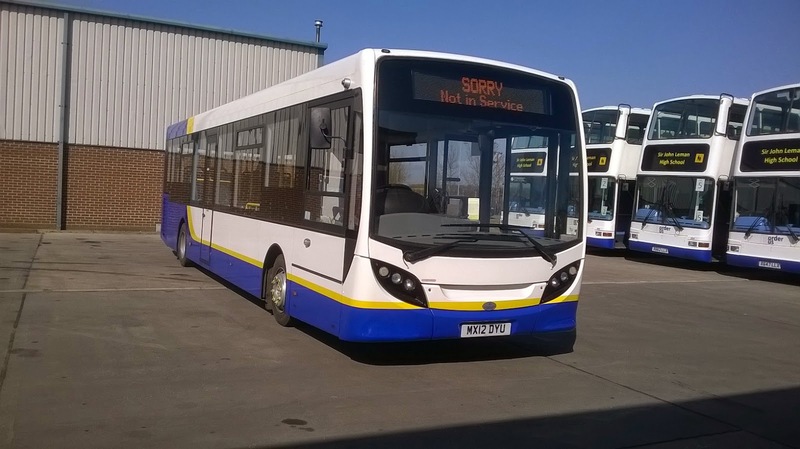 The first of the refurbished ex Metrobus Scania Omnidekkas arrived on Tuesday and was swiftly pressed into service. After I revealed that instead of using the Go-Ahead fleet number of 1504 Anglian had numbered it 556 to tie in with the rest of the fleet, I then heard from Arthur the Anglian Aardvark (the equivilant of Freddie the Frog as far as contacts are concerned) that all the 1504 vinyls have been removed, and now the Scania only displays 556. Therefore that makes the picture below quite a collectors item! 1504 is no more, only 556 remains. Finally, and thanks are due to Nicky Pursey for sending me this news story, some passengers in Brazil had a truly lucky escape when their minicoach was swept into a huge hole in the road and washed away by torrential floods. Next time you have a gripe about your bus service running a few mins late think of this and be thankful. The story, with dramatic video can be viewed by clicking here. I don't normally report accidents but this one was all over the media like a rash within minutes of it happening, complete with youtube videos so no harm will be done if I mention it. An Ambassador National Express Levante collided with the back of an Anglian gas bus on the Acle straight on Monday. There was extensive damage to both vehicles but thankfully no serious injuries. Anglian 104 is still waiting to be assessed and could be off the road for sometime. 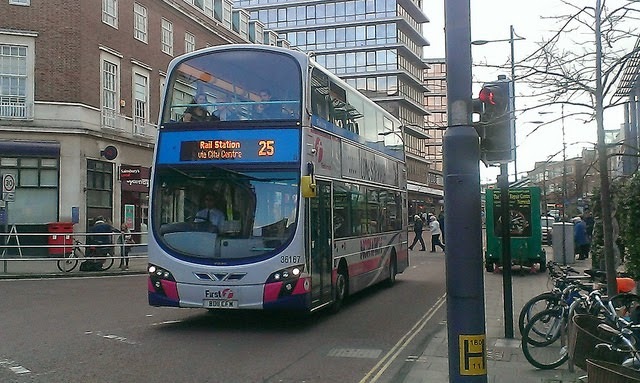 Ipswich Buses revealed the first of the refurbished X reg Darts on Monday. 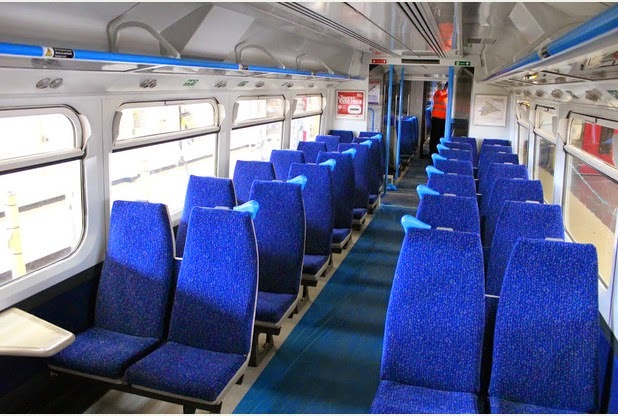 IB 93 has been converted to DDA compliant, and had leather seating installed. IB 98 has now replaced it at Hants and Dorset Trim. More on that in the post below. On loan Yarmouth Dart 42921 is to be made a permanent transfer to Norwich and will be repainted into Corportate livery I understand. Shame - would look interesting with a purple front. Gemini 2 36180 has been seen operating Yarmouth services after undergoing MOT there. The Norwich open top service started yesterday in the rain with a bus advertising Colchester Zoo. OK. Tomorrow sees changes to Sanders services in Norfolk. See here for more details. 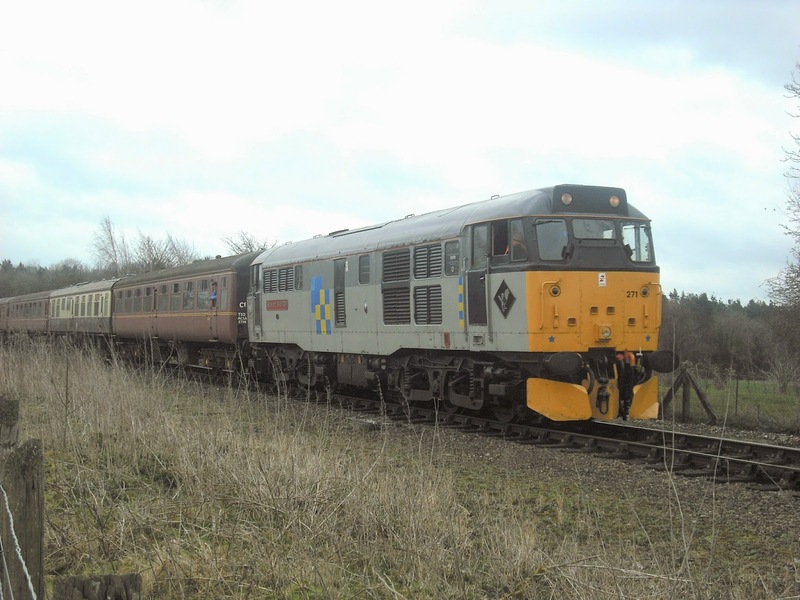 This weekend was the Mid Norfolk Railway's Diesel Gala. A full report and many pics can be found in the post linked below. I am well aware that I still haven't posted about the Norwich Running Day last Sunday, where apparently all I did was lean against a stationary bus. The post will be up tomorrow morning and happily I will be able to prove that indeed I did go out and about! However, leaning against a gleaming Routemaster chatting to intelligent and knowledgeable people about the subject I love is not a waste of time in my opinion. Then Chris Speed joined us and we had to stop talking about football and talk about buses instead!!!! Oh and apparently Shearings have got some new coaches. Just thought I'd mention it. Anglian's Schitzophrenic Omnidekkas I am the first to reveal that the Anglian Omnidekkas will have two fleet numbers, and more pics only to be found here. Anglian Scania 1504/556 Ride And Review I road test and review the new Anglian Omnidekka on its first day out, taking pics in locations away from the norm. Mid Norfolk Railway Diesel Gala Special I abandon myself in a sleepy corner of Norfolk to get you the best pics of the wonderful beasts taking part in this year's Diesel Gala. And that's it. A reminder that next week is Easter so Sunday services will be operated on Good Friday and Easter Monday, so if you don't have a Sunday service tough luck. Actually we don't have a Wednesday or Saturday service here now either so work that one out! 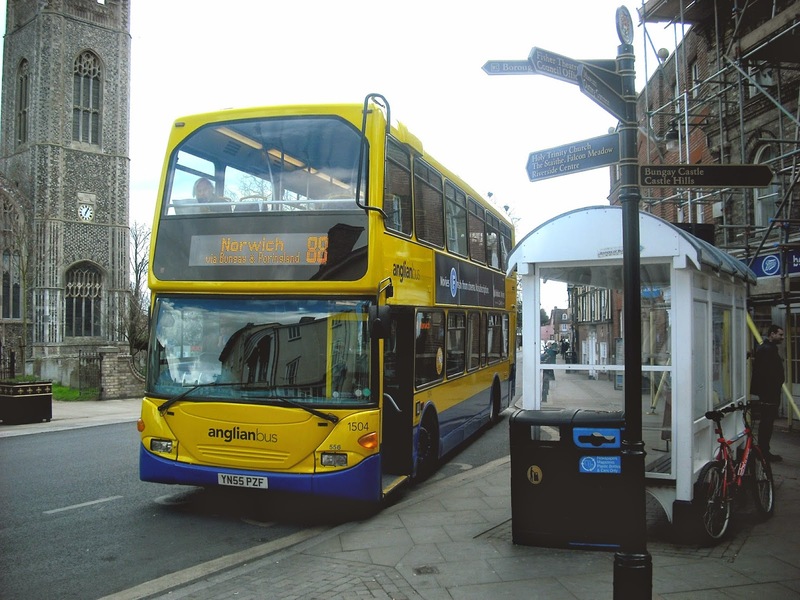 Check in tomorrow for the Norwich Running Day pics (AM), which will be different to any others you have seen (on blogs), and the latest on the Ipswich Buses changes in May (PM). 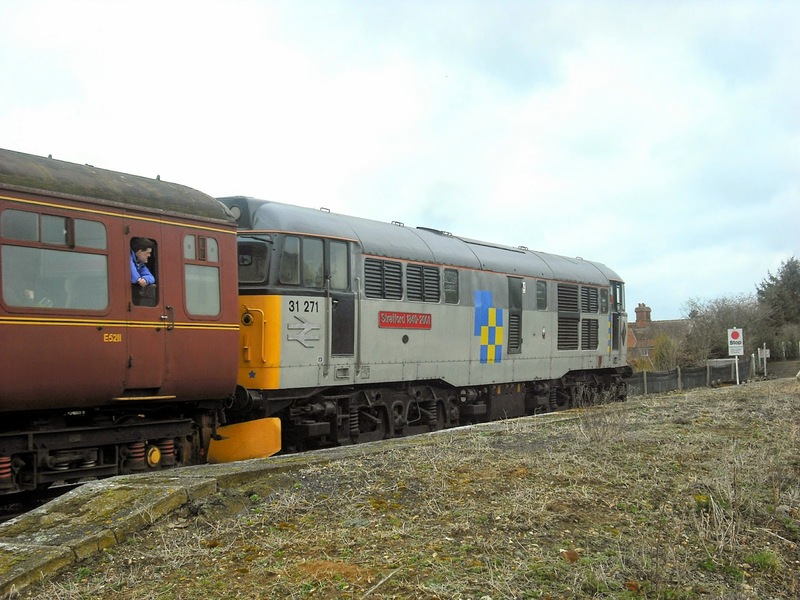 Mid Norfolk Railway Diesel Gala Special. There are occasions doing this I think I need to be sectioned. 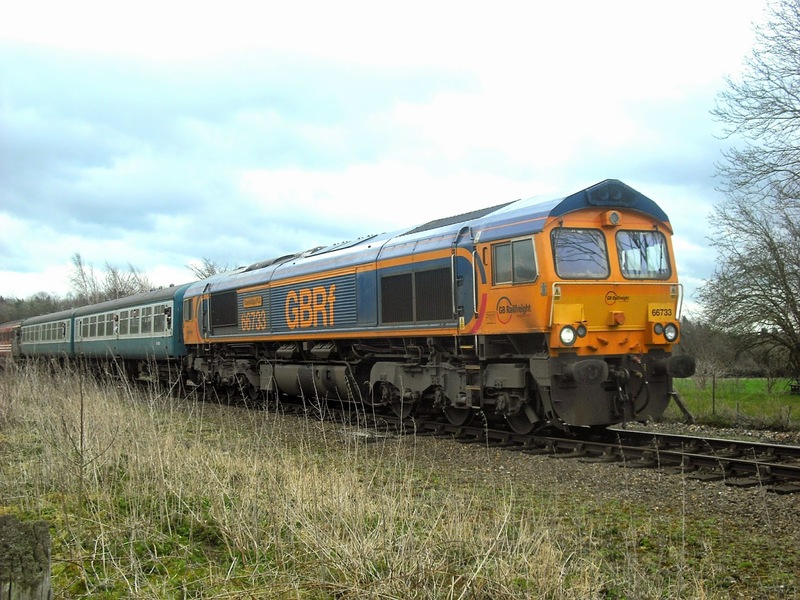 Today was one of those occasions when I decided to abandon myself in the middle of nowhere, despite a miserable weather forecast, just to take a few pictures of some Diesel hauled trains. 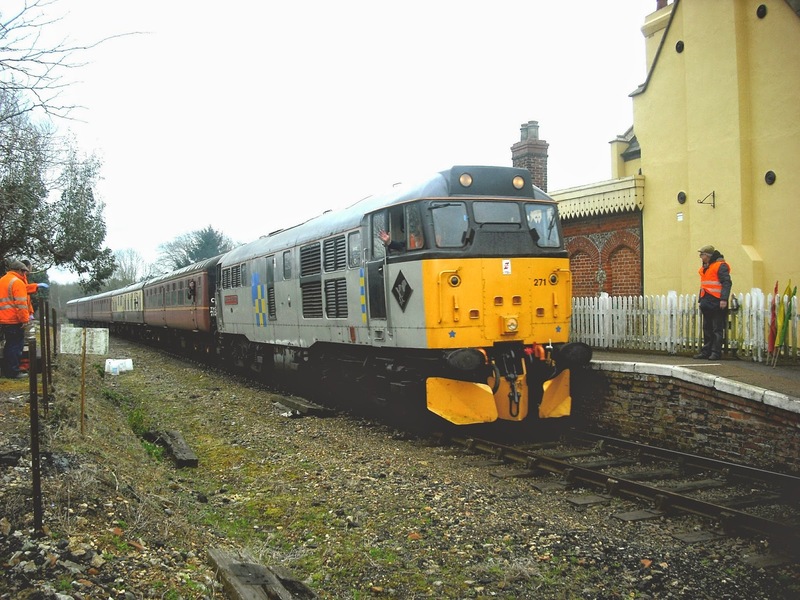 This weekend is the Mid Norfolk Railway's Diesel Gala, and for someone like me, who unlike most isn't that turned on by steam trains, it is an opportunity to see some classic diesels in use, as well as seeing some still in everyday use. After last week's Norwich Bus Running Day, where there were more cameras than I've seen for a long time around, I decided that I wanted to get as far from the madding crowd as possible, so I could get some un-crowded and unique photos. 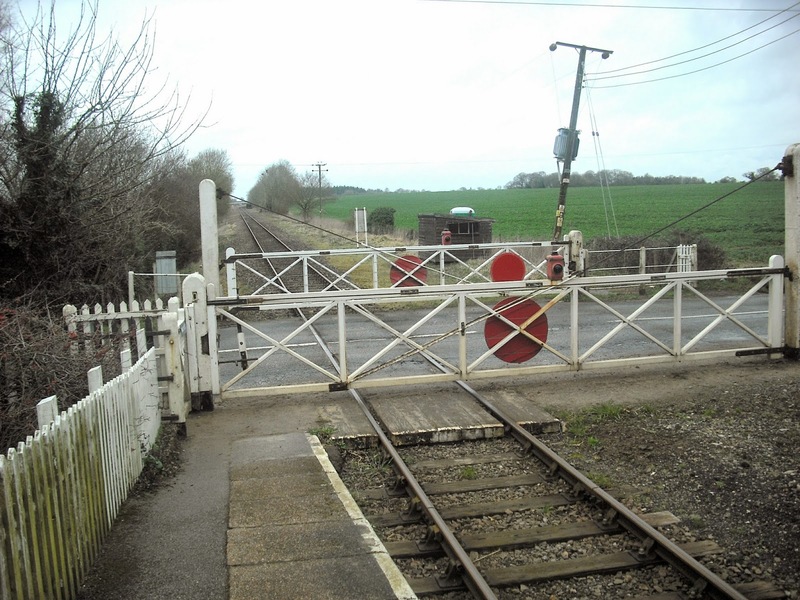 Thus I stationed myself, literally, at Kimberley Park Station, near Hingham, which today wasn't being used and trains were running fast, just slowing down for the level crossing there. It turned out to be an ideal location, and thanks to the amiable Crossing Keeper, who pointed me in the direction of a footpath giving me a great shot of Dereham bound trains, I got some pretty good pictures..
First train to come my way was Class 31 loco 31 271. The advantage to being at Kimberley was I got to hear all these wonderful locos at full throttle - real music to my ears. The timetable claimed this would be two 31's, but due to Colas pulling out at short notice some alterations had to be made. I thought I would get bored rigid only having two trains every 70 mins, but the peace was amazing. No phone signal there so no tweeting, texting or anything else, just the sound of birds, lambs, a bit of traffic which wasn't intrusive, and my own thoughts. It was almost meditative. Even when it rained for an hour it sounded and smelled good! The next train was top and tail. 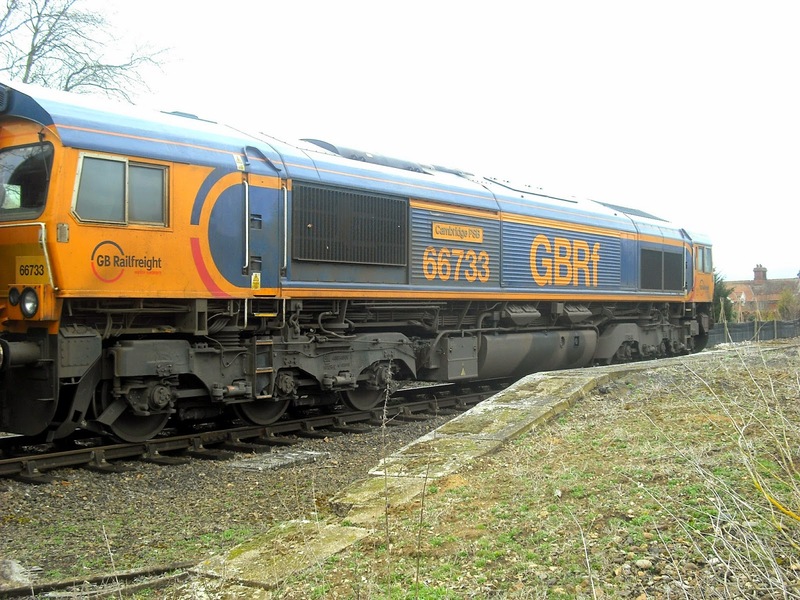 NMR's own 47 596 at the front, with a GBRF Class 66 on the rear. 66 733 was a late replacement for the Colas. A nice combination, and I got to see it go both ways from some really good angles. Next up was the 31 again, and I managed to get this lovely loco from two more different angles the noise she made on the way back was just magnificent! 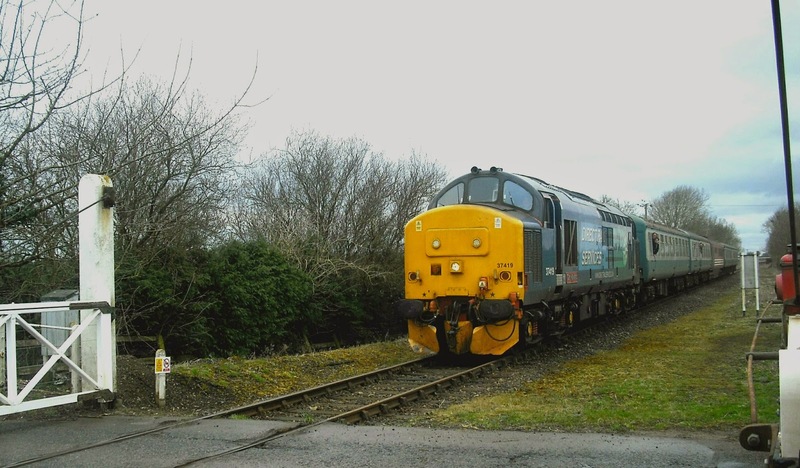 I was unable to stay as long as I wanted, due to other commitments, and I thought I was going to miss out on seeing a Class 37, my favourite loco. Thankfully though DRS sent 37 419 to cover one of the missing Colas, and so I had just about my favourite sight on the railways - a 37 bearing down on me at track level. I wish I could have stayed longer as there were some I missed, but all in all a surprisingly rewarding, and peaceful day. Will have to go there more often for a couple of hours when steam and DMU's are running. Before reading this post I advise you to read the first part of a post I published around this time last year. Click here as it is relevant to what this post will be commenting on. Before I pass judgement on the forthcoming changes here is a summary of them, with the vast majority of changes affecting the 7/61/62. Timetable completely revised with services now leaving Norwich at 10/30/50 past the hour. 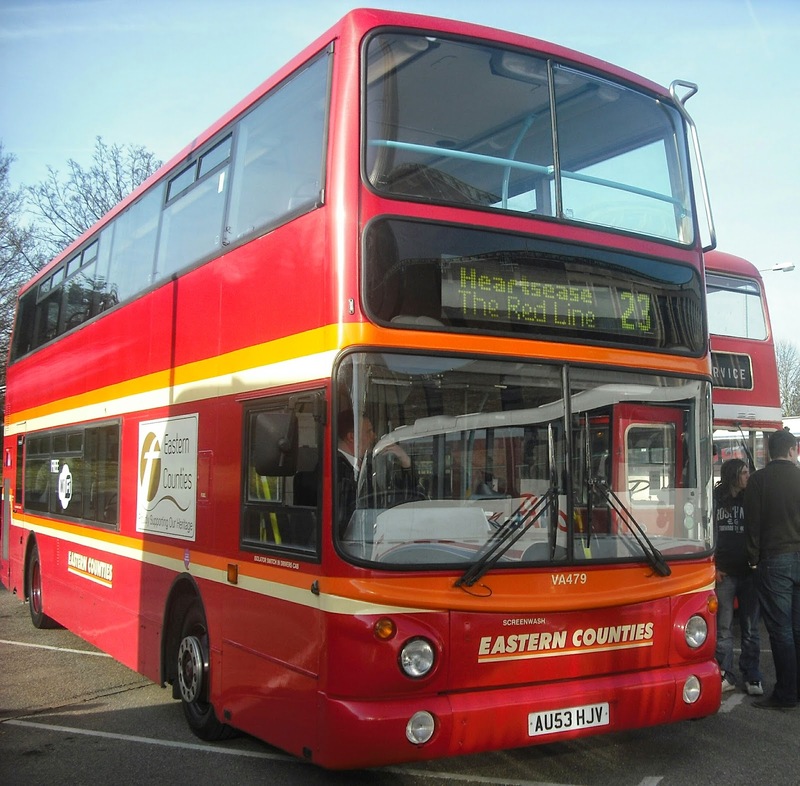 Two buses an hour will run through to Southwold, one via Wangford, the other fast from Wrentham to Reydon. Services reduced to half hourly from 1510 instead of 1600 as present. 61A to mirror First's 99 running at 20 min intervals between the 61's between Lowestoft and Kessingland. New evening service between Kessingland/Southwold to Lowestoft. Service withdrawn completely between Kessingland and Halesworth, and replaced by new service 60H between Halesworth and Beccles, with journeys continuing to Lowestoft as service 60. 60H will not serve Durban Close/Bedingfield Rd in Halesworth. 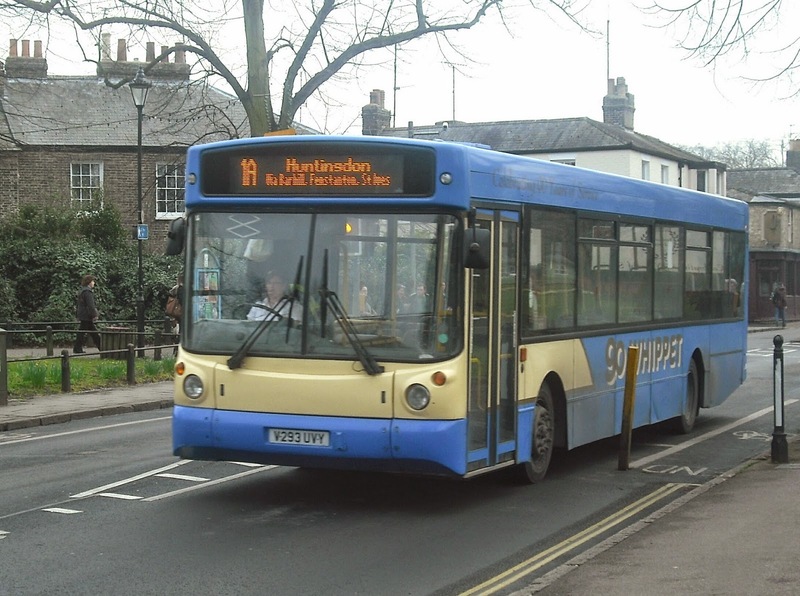 Passengers from Holton/Wenhaston/Blythburgh wanting Lowestoft are advised to travel via Southwold on 88A/61. Service completely revised with buses running fast between Beccles and Bungay, and in Diss the new Greenacres development will be served. Other routes have minor timetabe adjustments but nothing major. 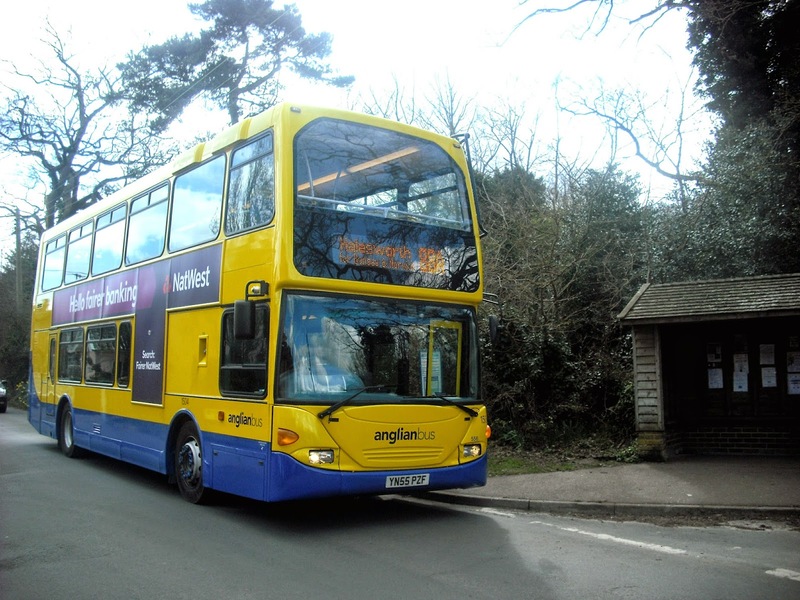 The College Days only Service 7A, which I reported as having been withdrawn and passed to Konect is, in fact still operating with a revised timetable by Anglian. Now if you were to ask me my reaction to these changes the words "happy" and "bunny" wouldn't be the first to spring to mind. In fact I'm aghast. 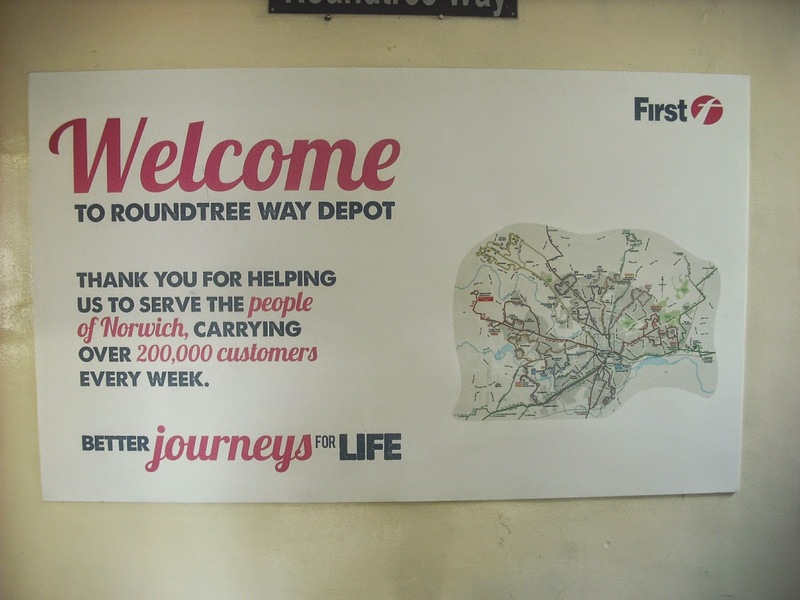 Anglian claim that these changes are made after customer feedback. Which customer? I can only assume he or she lives in Kessingland. Those of you who read this humble publication on a regular basis will know I go to Yarmouth a lot. I get there and back normally on the 62 from Halesworth, which becomes a 61 at Kessingland and carries through to Lowestoft and Yarmouth. It was formally the 602 and it is a great service. I can currently leave Yarmouth at 1650 and get back to Halesworth just in time for the last available booking on Suffolk Links. I can leave Halesworth at 0945 and get to Yarmouth in under two hours at around 1130. That 0945 is fairly well patronised in my experience. So how will that change in May. Well the 62 is being scrapped. To get to Yarmouth I will either have to travel via Southwold or Beccles. Let's see how my journey time from Halesworth to Yarmouth will improve from the current 105 mins leaving after 0930. The first bus to Southwold leaves at 1010, arriving Southwold at 1045 (I would have already left Lowestoft by now). There is a 61 at 1057 arriving in Yarmouth at 1237. So I arrive 67 mins later than I do now, and the overall journey time is now 147 mins. An improvement of -42 mins then. Ok let's now go via Beccles. Going that way at the moment I leave Halesworth at 1026 on a bus that is not only the happiest bus I've ever known but is normally full by time we get to Beccles. So obviously that bus has been cut. Instead I get the 60H at oh hang on the 60H doesn't serve Durban Close or Bedingfield Crescent, where I and a significant number of others get on. So we will have to get the 1036 88 to Saxons Way and change onto the 60H which leaves at 1050. Nothing like making pensioners wait at multiple bus stops in all weathers is there. The 60H arrives in Beccles at 1123. To get to Yarmouth I then need to change onto an 81, which leaves at 1135 arriving at Yarmouth at 1215. So 3 buses and a total journey time of 99 mins. A 6 minute improvement but 3 buses and 2 changes so really in the lap of the Gods, and still arriving in Yarmouth 45 mins later than I do now. Having said that I do now have an earlier option going that way which will be very useful on Saturdays. So via Beccles seems the way then. As long as I don't want to get back that is. Currently, remember I leave Yarmouth at 1650 to get back to Halesworth around 1830. The last 60H leaves Beccles at 1756, running request only to Halesworth at 1829, so chances are a few mins earlier if I'm the only one on it. So naturally you would expect that for passengers travelling from Yarmouth the 81 would connect nicely. Nope. I kid you not the 1720 service from Yarmouth arrives in Beccles at 1757 - a minute AFTER the Halesworth bus goes. Remember people are being encouraged to leave cars at home and catch public transport. The service before leaves Yarmouth at 1555, some 85 mins gap. Ok via Lowestoft it is then. Trouble is the 60 leaves Lowestoft at 1720, which means I'd have to leave Yarmouth at 1630, but that only leaves a 5 min window for the connection so any hold up and I'm rather stranded, so play safe and get the 1600, thus being forced to leave Yarmouth 50 mins earlier than present and wait at Lowestoft for 35 mins. If I travel via Southwold I will still have to get the 1600 from Yarmouth. Add that to the late arrival and my days in Yarmouth are going to be cut by a minimum of 95 mins. That's progress for you. You may think I'm being selfish in concentrating on my own journeys. I am not the only person to make those journeys. many people from Halesworth/Holton/Wenhaston go to Lowestoft and yarmouth, particularly in the Summer months. Many people from the part of Halesworth not being served by the 60H travel to Beccles. They are going to be affected just as much as I am. So why these cuts? Well it would appear that 3 extra buses are required for the 61A, and 2 of those have come from the 62. This is where the relevance to last year's post comes in. May I respectfully ask what the good people of Kessingland have got that the poor rural peasants haven't? Last time I looked Kessingland hadn't grown so why will they now need 10 buses an hour? 6 from Anglian, 3 from First and 1 from Borderbus. Are there that many passengers? Last year I scoffed at the 99, saying just running it from Kessingland to Lowestoft was pointless as there just weren't enough passengers to justify it. Anglian agreed with me when I spoke to them. The 99 has hardly been a roaring success, though I understand it makes just enough to justify it's continuance, so how do Anglian think they will squeeze anymore passengers out of Kessingland? 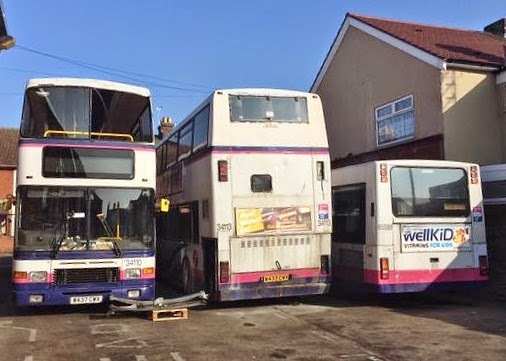 It is a U-turn of giant proportions, and yet again regular, loyal passengers have been dumped on in the name of bus wars. Clearly other operator's passengers are more valuable than own existing ones. I criticised the 99 when it started, but this 61A is in a league of its own. Next week my village drops to 4 buses a week. Kessingland fom May will have 10 buses an hour. Suffolk is a rural county, like it or not. It leaves a rather bitter taste in the mouth, and I'm sure my fellow 62 passengers will agree with me. And sort that late non connection between the 81/60H out please. You can view details of all the forthcoming changes on the Anglian website by clicking here. 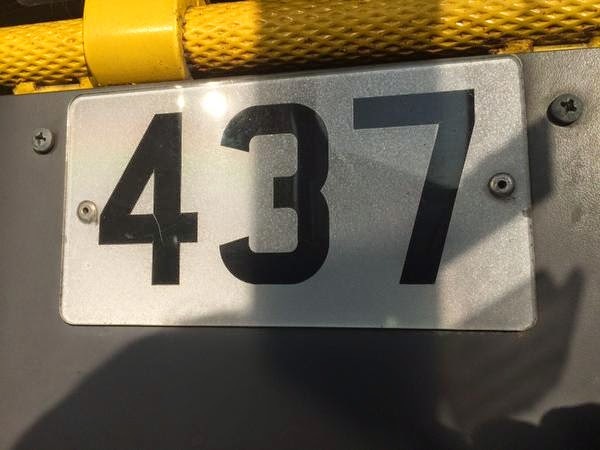 I posted the latest VOSA registrations yesterday (see here ) and one of the entries that created some interest was the registration of a 600 Park and Ride service from Hartford P&R site to County Hall, operated by First. Well Freddie has been in touch to tell me that it is a service for County Hall workers, much like the former Ambassador service (thanks Damon), and will run 6 - 8 times a day until September when the new P&R Norwich contracts come into operation. From now on ALL my contacts at First will be referred to as Freddie, to protect their anonymity. The only exception will be if anyone specifically says otherwise, or I am quoting a particular individual. It's taken time to get round to this post, due to real news which is always the best possible reason, but here are the Go-Whippet sightings from my Cambridge trip last week. 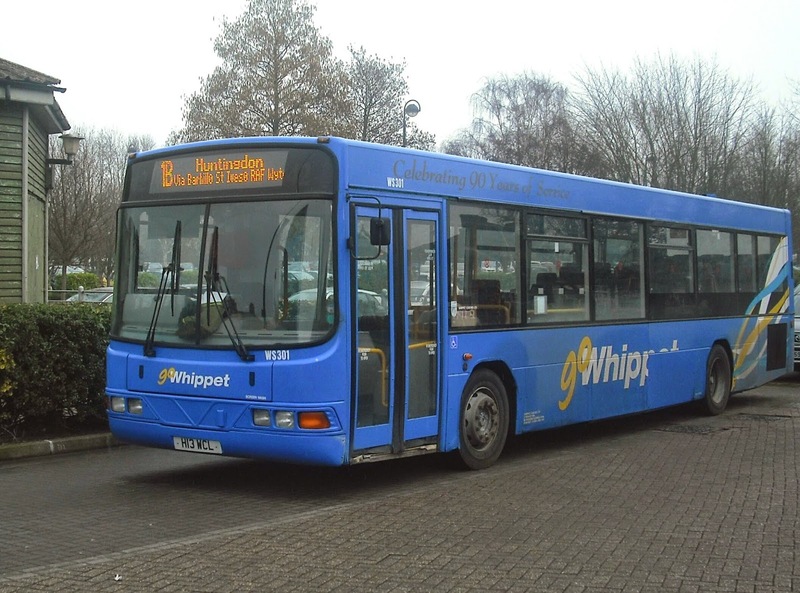 Go-Whippet, who were bought by Transit Systems in November 2014, are based at a modern depot in Swavesey, having moved there from Fenstanton in 2009. They have a fleet of around 50 single and double deckers, and 8 coaches, although sadly it seems like the new owners have decided to disband the Summer seaside coach services that have been operating since 1957. This is what I saw last week, the first three were seen in St Ives Bus Station. After travelling back to Cambridge the spotting continued with three different vehicles. The first one is quite a rarity in my experience. V293 UVY is a Volvo B10BLE with an Alexander ALX300 body. New to Reliance in East Yorkshire. And finally this Plaxton President bodied Volvo B7tl H18 WCL. Formerly London United W476 BCW the driver wasn't too happy to see the camera and roared past us first time round. I managed to get her on her way back though, although the picture isn't quite a sharp as I would like it due to the speed she was going! 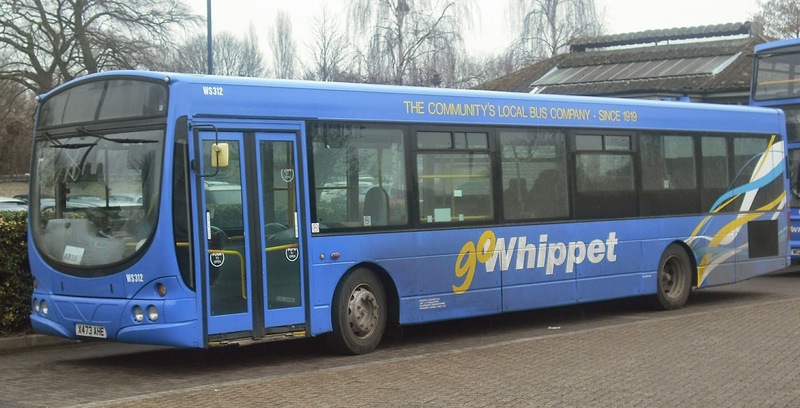 However that's six different types of vehicle from the Go-Whippet fleet. It will be interesting to see what direction the new owners take the company. New Service 6 operating every 20 mins from Tower Ramparts to Tower Ramparts via Cliff Lane, Hospital and Sidegate Lane. Now I must emphasise this is only my own guesswork and could be complete rubbish, but this is how I see it. The 5 is simply replaced by the X5, the 11 by the new Service 6, which I guess will be decker operated. The 1/3 will be replaced by the amended X1/X3 and 4. Have to say the new 6 will be a good route for the open topper on sunny days! I am meeting Malcolm Robson on Monday to discuss these changes and I will of course publish what's actually happening calling myself an idiot if I've got it completely wrong! What I have already been told is the number of buses operating will be "essentially the same". Over to Norwich and First have also registered a couple of changes on VOSA, including a rather intriguing new Park and Ride service. The changes are as follows. Service 903/904 between Harsford, Gordon Godrey Way and Hellesdon High School to amend timetable from May 24th. I am intrigued about the new Park and Ride. It gives no indication as to if it is a one off, a week or permanent. I have asked Freddie for information, which I will pass on when I get it - he's a busy frog! For our Essex readers First Essex and Stephensons also registered changes. 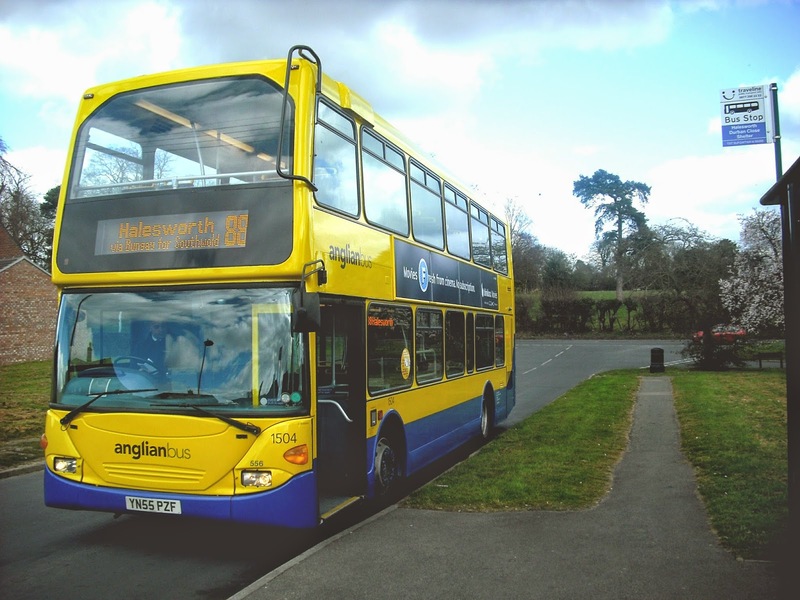 Stephensons have registered at very short notice a new Service 18, operating between Joyce Franklin Academy, Newport and Haverhill via Saffron Walden operating Mon - Sat from April 1st. I assume that's taking over from someone else. Moving North West to Kings Lynn where Norfolk Green have also registered some changes. So there we go, your local blog serving 5 counties today and first as usual! You can view all the registrations yourself by clicking on the link at the beginning of the post and searching Eastern Area 24/25th March. While I was at Cambridge last week I had a few minutes to kill before the train home and so took the opportunity to take a few pictures of what are now my favourite EMUs now the slam doors are long gone. So I thought it would be quite nice to do a history of the units. 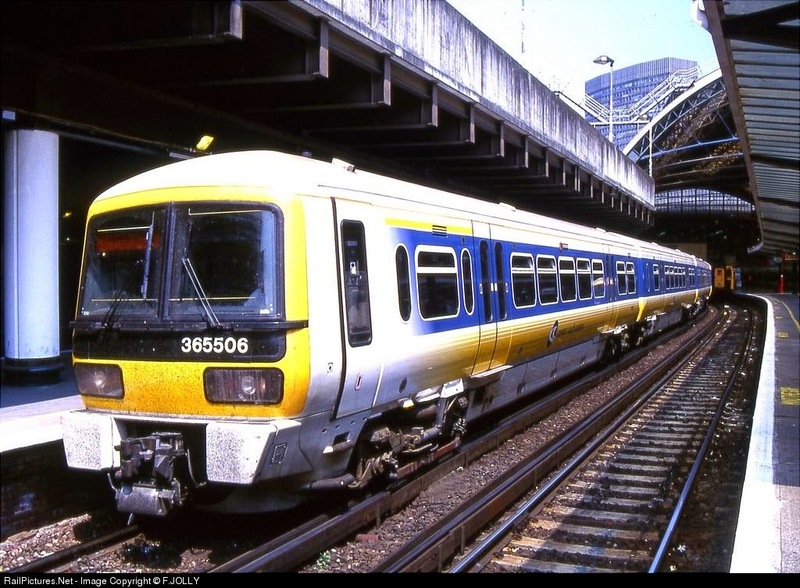 I remember when the Class 365 Networker units first came to Connex South Eastern on loan from WAGN (West Anglia Great Northern) in 1996. 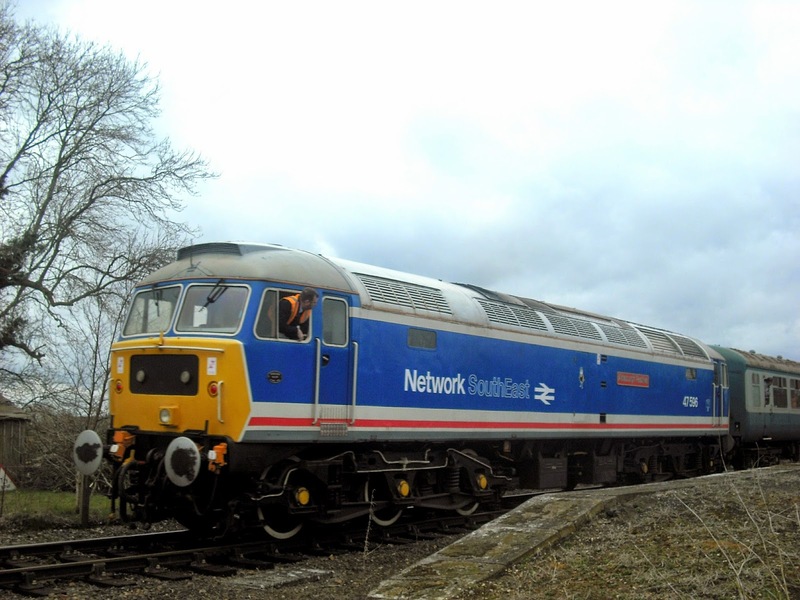 Apparently they did a bit of work in Network South East livery before that but I have no recollection of that. 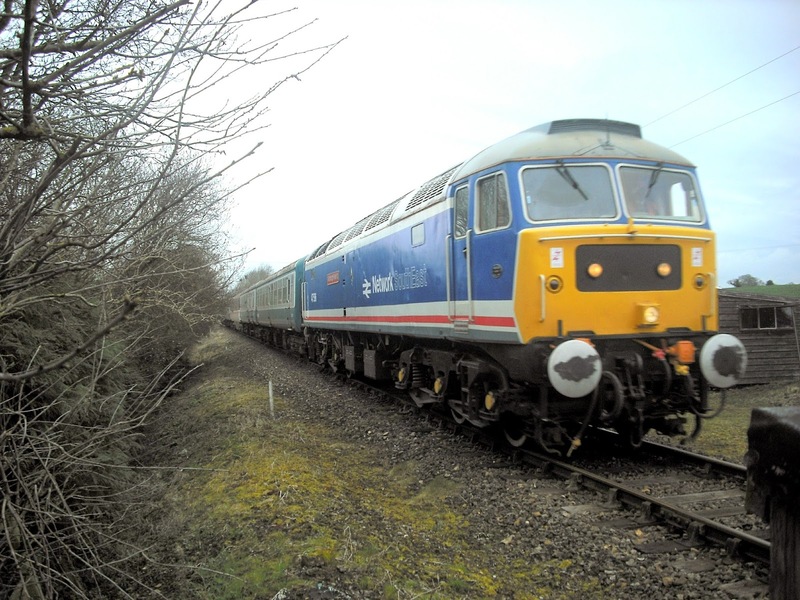 365501-516 were at Connex, with 365517-41 plying their trade up the Cambridge/Peterborough lines, as they all still do now. 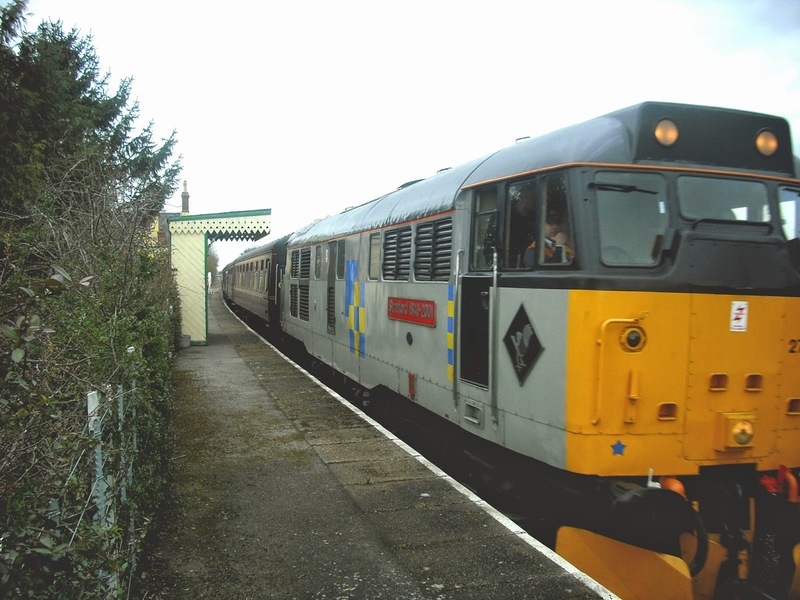 I have many pleasant memories of working the 365's as a Conductor and found them really decent trains to ride on too. I particularly liked the interior on these units. Warm colours led to usually very quiet trains, and rarely did I have any trouble on them. At 90mph they were easy to stand working in without needing to hang on for grim life. In 2004 all the Southeastern 365's were transferred back to WAGN, after being ousted by the new Class 375 Electrostars. The 365's were built by the ABB factory in York - the last trains to be built there before its closure, and they obvously made sure their last trains were flawless. After returning to WAGN the units had their DC shoes removed, pantograghs installed and were painted into NSE livery. 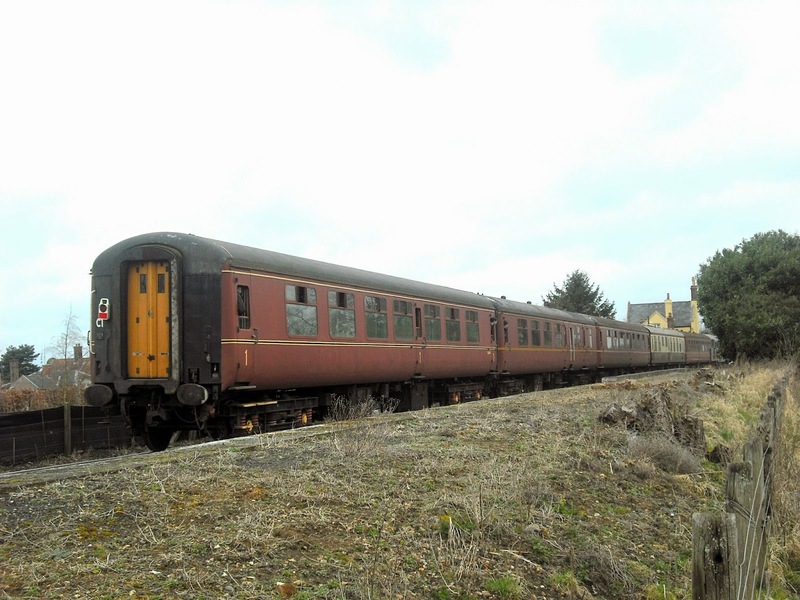 Here is the same unit, now in NSE livery, and the front has been changed to accommodate driver's air conditioning, giving them the nickname of the "happy trains". When First Capital Connect took over from WAGN another livery was created. I was lucky enough to catch one of the few still in FCC livery last week. Most of the 365 units are now in Great Northern livery, and have been refurbished internally. They now sadly bear little resemblance to their early days and in my opinion look rather cold and unwelcoming now. Four of the current fleet are in special liveries. 365519 carries a special Peterborough livery. Out of the 41 units 40 are still in service. 365526 was badly damaged in the Potters Bar crash in 2002. 3 coaches are in storage but one of the driving coaches was a write off. 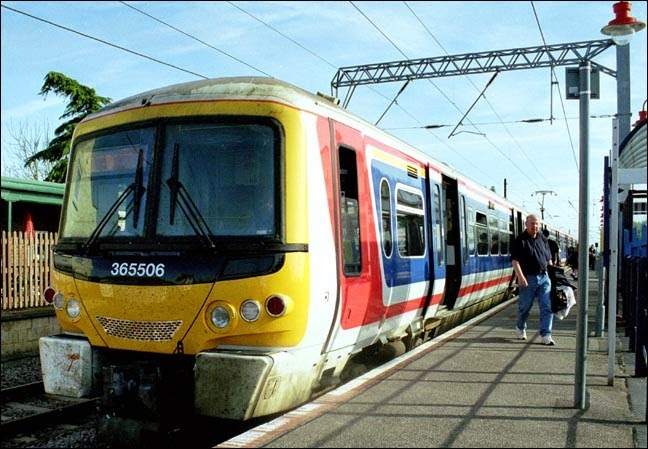 It was recently announced that 21 Class 365 units will transfer to First Great Western when their lease expires, for work in the Thames Valley following electrification programmes. I'll just keep the memories of travelling from Kent to London thinking how good those units were. First of all I have to thank Suffolk Links, without whose help this post wouldn't have been possible. They managed to alter my planned journey to Ipswich at extremely short notice so I could get to Halesworth instead to photograph and ride the newly arrived Scania Omnidekka YN55 PZF, which I'm going to refer to as 556, it's Anglian fleet number from now on. Many thanks guys. So having arrived at Halesworth I discovered where 556 was and rendezvoused with it at Bungay. Above all else it must be remembered that 556 is a 10yo vehicle. Omnidekkas this age rattle badly and 556 is no exception. However I have been on far worse Metrobus examples when on my hospital visits to East Grinstead. So now we have the rattling out of the way what about everything else. A rear view at Southwold. I really like the reverse colour logo. I'm pleased to say that everything else gets a huge thumbs up from me. 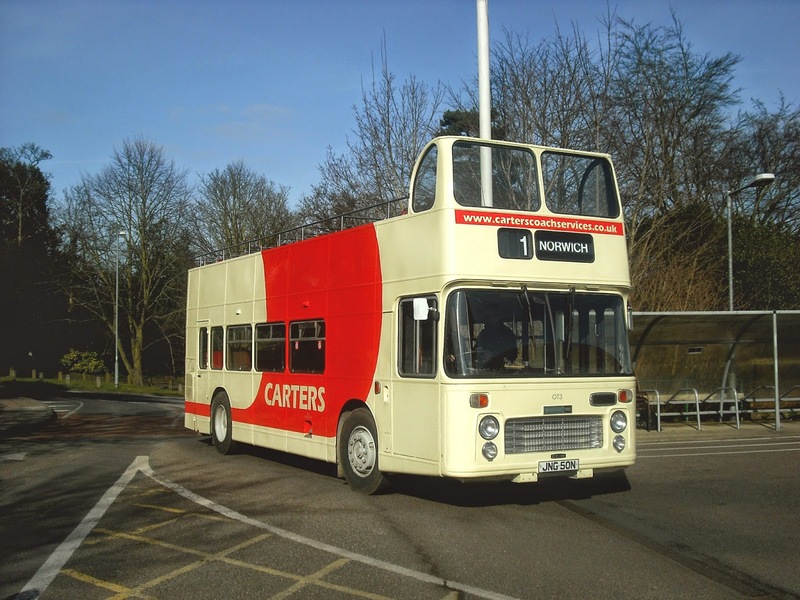 I travelled from Bungay to Southwold and back to Norwich on it - over 3 hours and my bottom was perfectly happy, unlike the newer Omni City deckers, where I start feeling it after ten mins. I like the interior design, and the silver poles compliment the blue and yellow seating well. Credit should go to Hants & Dorset trim, who have done a really good job with the refurbishment. A couple of oddities in that the legal lettering is behind the rear wheel arch as opposed to the usual front wheel arch. 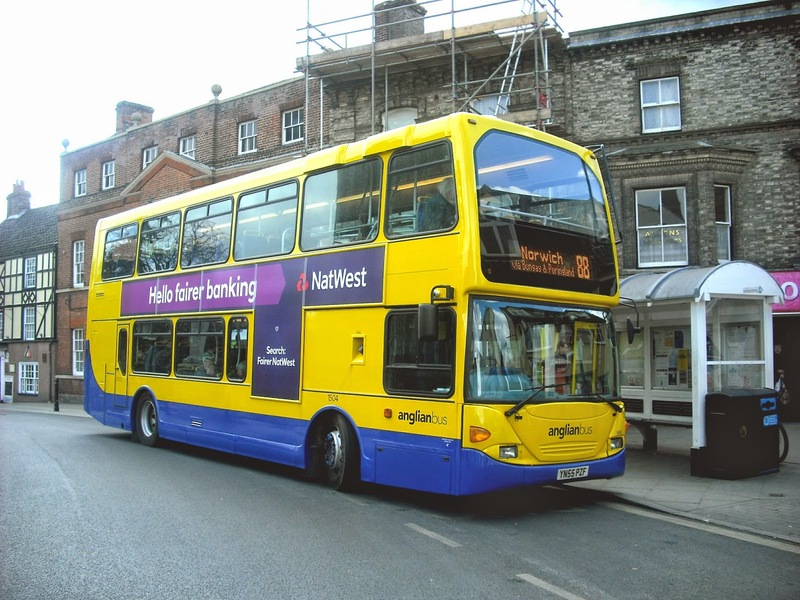 Also the Go-ahead fleet number 1504 is displayed front, rear and inside whereas the Anglian fleet number 556, which I'm told the drivers are to refer to it as, is only to be found above the nearside headlight. On the whole the ride is good, if you're not trying to type a post on it that is, as typing isn't easy. However the top speed is good, it's quiet apart from the rattles, and is by far the best double decker Anglian have got until the others arrive. I decided not to take pictures in Norwich, as everyone will be doing that, but took pictures in Halesworth. Southwold, Wenhaston and Bungay. Thanks should go to my driver, who typified Anglian by being friendly and accommodating. They really are a decent lot on there. As soon as I hear details of the others, indeed there are even unconfirmed whispers of a possible 4th arrival you will of course read it here first.